We are recognized as one of the reliable Natural Snail Repellent Suppliers in the country. Our Snail Repellent / Attractant bait easily call and kill biologically to destroy the snails in gardens. Apart from these, our Non Poisonous Snail Repellent is also used in nursery, gardens, playhouses, construction sites to kill all the unwanted snails. As these snails eat the new buds and leaves of the plants in the garden, our product helps to protect the plants from them. 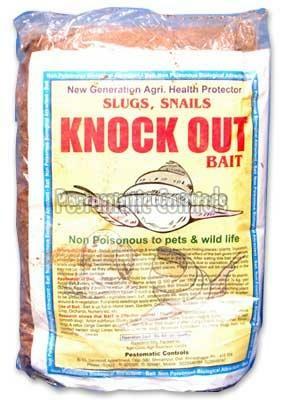 Bait is attractive to slugs & snails, luring them from hiding places / plants. Ingestion, even in small amount will cause them to cease feeding. This physiological effect of the bait gives immediate protection to plant, even though the slug’s snails may remain in the area. After eating this bait snails stop feeding, becomes less mobile and begin to die within 3-6 days due to starvation. Dead body may not be visible as they often crawl away to secluded places. Plant protection will be observed as an immediate result of the product as there will be decrease in damage. Application of Bait : Bait powder or granules should be scattered or thrown on the soil around or near to plants. Apply bait evenly where the pest occurs in damp areas @500gm per 1000 sqft( half kg per Guntha or R). Reapply if the bait is eaten off pest appeared. Bait should be applied around the perimeter of the plants and the vegetable in such way that it will work as an artificial barrier to snails. Apply bait in such way that pest will encounter bait before plants species. Apply evenly in lawns, between rows of vegetables, in and around seedlings. For bigger sized plant place the bait around the stem as a circular band. Use of bait : Bait is useful at Lawn, Home garden, turf, Green house, vegetables, crops, orchards, nursery, and outdoor landscapes or at any place where the pest snail occurs.